When choosing a supplier, we know that value chain experts require on-time delivery of quality product and Illing® Company has built our business around this need. Our purchasing and production teams are dedicated to making sure that Illing® Company delivers consistent, high quality product. This begins with a trained professional sales and customer service group to ensure your needs are clearly understood and matched with the right products and suppliers. Illing® Company has expertise in all aspects of Total Quality System development. Our dedicated professionals ensure the entire value chain is operating with quality in mind and we leverage over 100 years of combined experience in glass, plastic, and metal containers with direct links to every tier one manufacturer. When determining the compatibility of continuous thread (CT) closures, it is important that both the bottle neck and closure have the same finish. The finish of a CT bottle is composed of two numbers separated by a hyphen, such as 28-400. The first number is the outside thread diameter of the container in millimeters. The second number is the thread style or finish. That number determines the number of turns required to seat the closure on the container. If these numbers do not match, the security of the closure may be compromised resulting in leaking package. A lower closure finish number (400) may be paired with a higher neck finish (410) but the closure will sit high on the neck and not cleanly against the transfer bead. Uniform standards for neck finishes for plastic bottles have been set by The Society of the Plastics Industry (SPI). The closure industry doesn’t always adhere to SPI standards so it is important that the bottle and closure are tested together prior to ordering. Charring occurs when burnt fragments of plastic accumulate in the mold, break free during production and appear in the bottle as black specks. Proper mold maintenance and quality inspection is key to minimizing the occurrence in production. Flashing occurs when plastic resin is not properly contained in the mold due to part misalignment, mold wear and/or improper production settings. This can result in thin strips of plastic at the parting lines where the two mold pieces joint together. Pinholes are tiny holes that can occur in a bottle due to improper mold flow, resulting in leaky packages. Many bottle producers utilize in-line leak-check equipment to ensure bottle integrity. The stiffness of PE at 140° is 1/2 of that at 73°. Types of hot fill—pie fillings, flavorings, sauces, driveway sealers. Maximum use temperature is 160°. At this temperature some annealing may take place resulting in shrinkage, warpage deformation. Pails should not be stacked more than two high. The contraction of contents upon cooling will create a vacuum. Extent of vacuum dependent on headspace and lid seal efficiency. Pail sidewalls give the appearance of being “sucked in”. Stacking should be minimized during the cooling phase. ESC is a type of failure that occurs in molded plastic containers and covers when specific conditions are present. Failure is usually initiated on the surface of a molded part that is under stress and in contact with an aggressive fluid, which promotes initiation and crack propagation. The other factor is time. Failure is primarily a function plastic under stress exposed to certain fluids over a period of time. The addition of heat (e.g. hot warehouse conditions during the summer), will accelerate failures because of the reduction of pail stiffness, thereby increasing stress. What Does an ESC Failure Look Like? The failure starts out as a small smooth crack. Under load, the crack will propagate in a tearing manner. 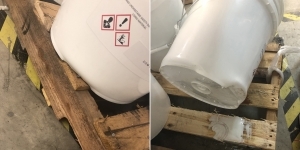 Failures are usually found in containers located in the bottom row of a pallet. Once one package fails it’s common for the load to shift in the pallet resulting in a number of containers toppling over. There are two type of stresses—External and Internal (molded). compression through tight stretch wrapping and banding. What is Environmental Stress Cracking Resistance (ESCR)? Environmental Stress Crack Resistance (ESCR) is a measure of the resistance of plastics to failure in this mode. To check how well plastic will perform with a specified liquid, two types of lab tests based on ASTM procedures are available. We generally enlist the services of resin suppliers to perform this function. Low surface tension aliphatic-based detergents permeate voids fractions developed under stress which promote separation and fissure between adjacent crystalline regions, resulting in cracking. Acids and bases react with PE surface to break polymer bonds. Blistering and cracking occurs as penetration continues through “pitted” or “etched” surface cracks. Embrittlement occurs with resulting loss of elongation properties. Organic solvents are soluble in polyethylene. After permeating surface, they absorb into the amorphous to cause swelling. This results in a plasticizing effect with a loss in stiffness, buckling, “elephant-footing” and sometimes splitting. Solvent failure is technically not ESC.